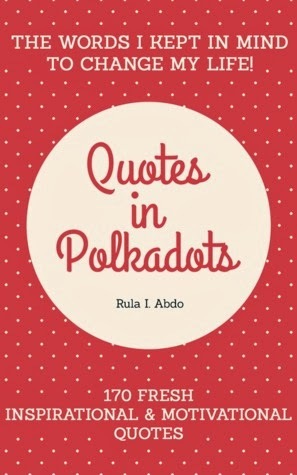 Quotes is Polkadots is a different type of book. It isn’t a story or novel. It is a book of life quotes written by the author. 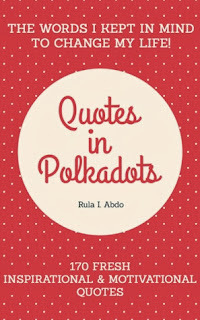 As described by the title, the pages are designed with polkadots. The author herself is a young graphic designer, so I like that artistic touch she added to the book. There is a different quote on each page, so if one really speaks out to you, you could tear it out (or print it if you buy the ebook) and hang it up in your home or office as a cute reminder. I love reading inspirational quotes, so that may be why I enjoyed this so much. But, I believe it would be a good gift to yourself to look through during hard times or stressful days, and it could also be a nice gift for someone close to you. These quotes were written from life experiences from the author. There is something in here for everyone. You may not relate to all of them, but you may find a special one that really touches you. I say it is worth the purchase! 4/5 stars I sort of with the design would change a little throughout the book, but the change in colors is nice too. The simplicity is nice.